The dogs listed below have now found permanent loving new homes. Khan is a beautiful young man, who has recently been rescued from a regional pound. He is 10 months old, and is still growing into his big paws. He is such a people pleaser, and responds to everything his new carer asks of him. He gets along well with the 4 dogs he is living with, which is both dogs smaller and larger than he is. Khan will be vaccinated and desexed in the coming week, and then he will be ready for adoption. Please call Rod his carer to organise to meet him! 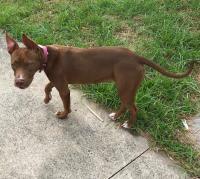 Stella is a lovely young red Staffy x Kelpie who has recently been rescued from a country pound. She is currently a little timid, especially around new men, but once she gets to know you her beautiful nature comes out. 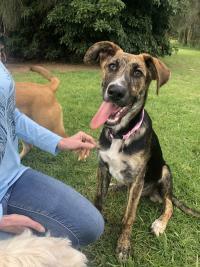 At 8 months old she is still quite young and would benefit from obedience training and patience from her new family to help her develop and feel comfortable in her own nature. 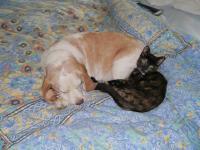 She is currently in care with a larger and older dog, and interacts with him very well. Whilst she is getting used to the lead, primarily because her surroundings intimidate her, she is very well behaved in the car when travelling. She has recently been taken in the car for a swim in the river with her new family, and absolutely loved the water. Stella is unlikely to grow in size but she is quite skinny at the moment, and so will fill out. She currently weighs around 15kg, but is likely to be closer to 20kg when she is back to her healthy state. Currently she is being kept inside and outside, sleeping inside at night, which has been really beneficial for her with getting used to her surroundings. It would be great if she could go to a home where she could continue to sleep inside. Stella has had her first vaccinations and is booked into be desexed in the next few weeks, so she will be able to go to her new home after all this has happened. 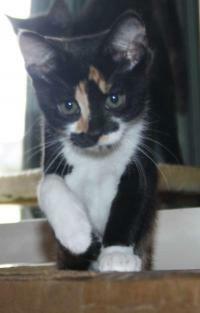 However, she would love to meet her potential new family! Get in touch to learn a bit more about her! Ivy (previously Delilah), is a beautiful Bull Arab x Dalmation, originally from Rural NSW. She is a lovely, brindle coloured girl, looking for a Forever home where she can be active, safe and loved. Ivy has had formal obedience training (Bark Busters), from her previous owner, and she is very attentive. As Ivy is a large breed dog, she has great stamina and needs plenty of exercise so she doesn't get bored. She also plays well with other dogs but due to her size and excitement is probably best not with cats. Ivy does have a love of water and shell pools, but she adores humans! Ivy is also vaccinated, microchipped, wormed and desexed, as part of the adoption fee. If you are looking for a sweet, friendly dog who loves people...come and meet Ivy! If you are worried about Ivy getting on with a current dog you own, you are very welcome to bring it along for a meet and greet! Smartie has been surrendered into care to find her a new loving home with plenty of time and energy to give her the attention she needs. She is very playful and talkative. She's very smart and a quick learner. She is looking for a quiet home with no loud noises. She would like to be an indoor dog with access to an enclosed yard. She needs someone with time and patience to earn her trust. New people can be a bit scary for her to begin with but will come around once she trusts you. She is best in a home without young kids and caution needs to be taken around new people as she can be protective. She does not like cats and will growl at them. She needs to be rehomed to a cat free home. She is approx 2-3 years old. DOB is not available but we believe she was desexed at 6 months of age which makes her just over 2 years old. She was desexed in May 2017. She has been vaccinated, heart worm tested, flea treated and wormed. Vet Check - She has grade 3 floating/luxating Patella's. No corrective action needed at this time. 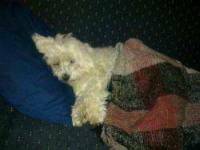 Test results from blood test show Negative for Heart Worm. No other health issues were noted. Will need a booster vaccine in February. 12/1/19 - Smartie has had lots of inquiries and expressions of interest. Smartie is on Hold and it appears we have a home for her. Hi, meet Angus, a beautiful 5 year old small to medium sized Pomeranian cross who was rescued by his neighbour and put into DCH care after he was continually physically abused by his male owner. He weighs about 6 kgs. Needless to say, Angus is not holding any grudges, does not bite, races to open doors and is toilet trained. Angus gets on well with other dogs but not sure with cats. Chases birds. Angus has a beautiful non-shed coat that is easy to maintain. Angus is quite the smoocher, obedient and friendly. Angus seeks assurance when thunder is around. Being 5 years old, Angus has lots of energy to expend and would benefit from daily walking and room to run around in a yard. Angus is best suited to soft spoken but stern owners that can remain calm if he does anything wrong (which he hasn't yet at his current address) - just so he can learn and understand the ropes of his current living situation. Ellie came into care with her brother as a very quiet and shy girl, but soon showed she was a little more confident than him. Ellie 6 months old and is . a great dane x bull arab with mesmerizing blue/hazel eyes. She's a very sweet and mature puppy who is good natured and enjoys life. She loves human and other dogs or cats company but she also keeps herself busy running around the garden with her toys. It's always quite a show to see her play! She knows sit, paw, lie down and roll over and is a quick and motivated learner. She loves bush walks and adventures (she's been camping, swimming and hiking).In a nutshell, she is a happy playful loving puppy looking for a caring family. Please contact Jo on 0401 900696 for more information of Ellie, and to meet this lovely young girl. 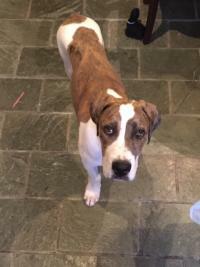 Ellie will be de-sexed, immunised and heartworm tested prior to adoption. 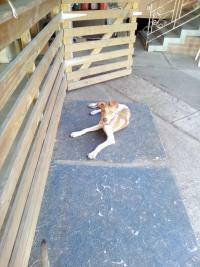 Levi has come into DCH care from a Country NSW Pound. 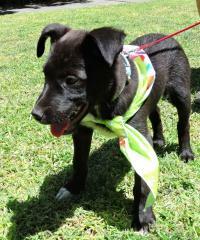 Levi is currently approx 10 weeks old and is a Border Collie X Kelpie. He is looking for a new home where he can grow and have lots of love and attention. He will need some space and will need someone with some time and energy to ensure he gets daily walks and exercise. Will be available for adoption once Desexed has been completed. Pippa has come into DCH care from a Country NSW Pound. 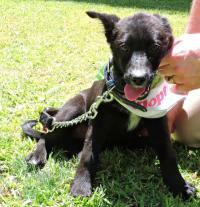 Pippa is currently approx 10 weeks old and is a Border Collie X Kelpie. She is looking for a new home where she can grow and have lots of love and attention. 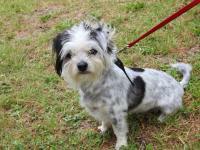 She will need some space and will need an owner with some time and energy to ensure she gets daily walks and exercise. Colby is a very shy but also very sweet boy who just likes to be around people constantly, following his carer everywhere and laying in whatever room she is in. At the moment he is very quiet and as such is being walked much as he is still scared of his new surroundings, but would need someone who has the time to spend with him and make him feel comfortable, and eventually get him out and walking and around other dogs. He has lived with dogs previously, and has used them as comfort, so would not be against going to a home with another dog. He is now by himself with his carer, to try and help build his bonds with people. He's is a beautiful and lovely natured dog. Please contact Gemma for more information and to meet Colby. Hi I’m Carly! My foster carer tells me I am most probably a Dalmatian x Bull Arab because that’s what my ma and pa were on the farm I was surrendered from.. I am 5 months old and I came from a litter of 6... I am the last one to find a home and I don’t know why! I LOVE people! You can find me cuddling up to you(I’m not too big to be a lap dog..yet) and licking your face as soon as you are on my level to do so. Currently I live with an older, smaller dog who doesn’t really care for other dogs and a 1 year old male who loves the company! 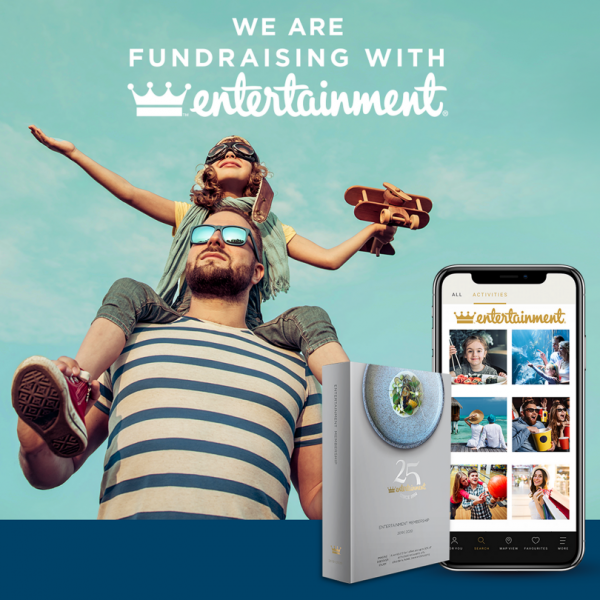 We play all the time! I am getting better at walking on a leash and I often go with my other doggy friends to the dog park to socialise with all different types of dogs, you could say I’m an all rounder!! If you would like to adopt me and make me your furever doggo contact my foster ma on 0424135579!